NOBODY WALKS IN L.A. finds Miles (Adam Shapiro, Steve Jobs) and Becca (Kim Shaw, She’s Out of My League), former high school friends, reconnected after a mutual acquaintance Jeremy (Matthew Nicklaw, Hand of God) calls Becca to intervene on a very depressed Miles who is curled up in his darkened bedroom. Apparently, Miles’s fiancée Samantha (Sarah Satow, Step Up) has cheated on him two weeks before their impending wedding. As part of Miles’s recovery program, Becca gets him to agree to take a “memory lane” return to their high school era and spend a day in a simpler life sans cell phones or cars as they begin their walk around Los Angeles. The pair embarks on their respective journeys of self-discovery, and we find out that Becca is considering moving to New York and opening an art gallery with her friend Erin but she is conflicted about leaving her widowed father (Peter Breitmayer, Fargo). Meanwhile, Miles’s parents are arranging a “pow-wow” about the wedding because of the money that they have already invested in it. As they walk, ride the bus, and take the subway, Becca and Miles start talking about each other, their pluses and minuses, their hopes and aspirations, and their current uncertainties. It is revealed that each had a crush on the other during high school, but at different times, and had kept it under wraps so that their friendship would not be jeopardized. In the span of just one day, Becca and Miles start behaving like an established couple that argues about religion, questions what relationships really mean, and probes the value of human life. While the future of this young man and young woman may be no more certain than it was when the film began, they have come a long way to finding out more about themselves and, just maybe, this will not be their last walk around L.A.
Writer/director and native Angeleno Jesse Shapiro, in his debut film, takes us on a tour of Los Angeles using the random route traveled by Becca and Miles. 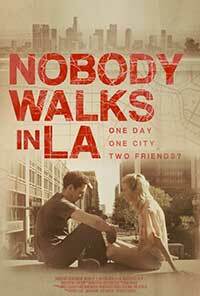 Nobody Walks in L.A. is Shapiro’s very obvious love letter to his hometown. In his own words: “A city is a living, breathing organism that changes with time. I believe it’s time for people’s perceptions of Los Angeles to catch up with its current reality. I hope this film allows people to see, hear, and feel Los Angeles like they never have before. I want it to inspire people to become one with this city and all it has to offer – its people, its art, its music, its history . . . and its sidewalks”. From the open markets to libraries, diners, mission lines, and parks, John Frost (The Diabolical) has his camera crew cover the small details that often elude the everyday denizens of the City of Angels. After a very fast 90 minutes, even if you have never been to LA, you get the feeling that you are now a part of this very vibrant and multi-layered city. The two principals, Adam Shapiro and Kim Shaw, give us very credible and sympathetic characters that make what is scripted seem fresh and spontaneous. Nobody Walks in L.A. is a clever, fun, and thought-provoking indie film that will recall the early directorial efforts of Woody Allen in Annie Hall and Rob Reiner in When Harry Met Sally. This film has been recognized at both Long Beach Films Festival, New York, and the Newport Beach Film Festival with Audience Awards for Best Narrative Feature. Highly recommended. A delightful indie romantic comedy that gives viewers an intimate walking tour of Los Angeles seen through the eyes of a young couple.